Delivery: The delivery day is agreed with the customer in advance. Tuffnells couriers service is kerb side delivery, someone needs to be present to receive the delivery. NO ETA IS PROVIDED ON THE DAY. The customer can upgrade for £12 to a morning delivery pre12. The designs are very orignal and the components are of excellent quality. The range consists of towers and modules, that can be combined to make fantastic play centres! Fun accessories like steerin wheels, binoculars, bells, blackboards, flags, etc can also be added for added play value. Build attractive, durable and completely safe playground equipment for your children! With Blue Rabbit® you can do it in less than no time. With the components and the matching manuals from the Blue Rabbit® building boxes you can build safe and attractive playground equipment without a hitch. Timber cut to size, kits and slides are included in our prices. The products have been developed from A to Z by Blue Rabbit's own design department and in addition, checked tested and approved, piece by piece, by TÜV Rheinland Product Safety, THE authority in the field of playground equipment control. SAFETY comes first with Blue Rabbit®. Nothing is left to chance during design and production to keep risk to your children to a minimum. All Blue Rabbit® components meet the most stringent safety standards. Blue Rabbit® accessories have the GS/TÜV certificate (nr S 60008358), whereas the playset and tower constructions hold a TÜV Bauart geprüft certificate (nr R 60008359). This guarantees that the products satisfy the most recent European Norms EN 71 –1,2,3 & 8. This does assume that you only use Blue Rabbit® components, that you carefully follow instructions and that you very meticulously respect the quality requirements in the Blue Rabbit® documentation when purchasing the timber. Age range: 3-10 year olds generally, but there are baby seats as well which will cater for younger children on swings. "The entire Blue Rabbit 2.0 range is developed in house by our own team of experienced product designers. Our company has more than 20 years of experience and knowhow in developing playground equipment and accessories. The Blue Rabbit 2.0 play structures are extra strong and robust constructions, with solid secured connections. State of the art swing corners, together with the most advanced hardware setpossible, ensure the quality of the range even more. Safe play guaranteed. The Blue Rabbit 2.0 play sets are developed entirely according to the latest European EN71 standards for residential play equipment. TÜV Nord, one of the most experienced inspection agencies on the market, thoroughly inspected, tested and certified all play constructions on our request to guarantee the user safety. Blue Rabbit 2.0 has received a‘TÜV Baumuster geprüft’ certificate, issued by TÜV Nord." All timber is sourced from suppliers whose forest management practices adhere to strict environmental and socioeconomic standards in accordance with the Criteria of the Forest Stewardship Council (FSC). The timber is pressure treated REDWOOD and comes with a 10-year anti-rot and anti-infestation guarantee. The uprights supplied are as standard 7cm x 7cm. Prices are available with 9x9cm timber, please contact us if you require this specification. The timber we supply is cut to size, but is NOT PRE-drilled. You will need to do the drilling while building the play centre, with the specific drill bits that are included in the box. The instructions are very clear. The towers come with platform heights of 60cm, 90cm, 120cm or 150cm. The Toba slide for 60cm platform height, available in the Cascade, Platform module or the Penthouse tower. The 120cm platform height will take a 2.2m long slide, and the 150cm platform height will take a 2.9m long slide. The slides come in blue, green, or red. If you would like to have a tower without a slide, and to add another module instead, please contact us for a price, as that is perfectly possible in this range. Plastic components are UV-stabilised and hence colourfast, just like the plastic roof covering of the Blue Rabbit® towers. These are made of UV-resistant and waterproof polyester canvas. All Blue Rabbit® ropes are made of user-friendly “polyhemp” roping. These ropes have a natural aspect, do not overheat sensitive young skin and in addition consist of almost indestructible resin. All Blue Rabbit® rope connections are made of very durable plastic joints. No complicated and time-consuming accessory assembly: all Blue Rabbit®components are ready for use and available nicely packaged. All Blue Rabbit® boxes are also protected against moisture absorption by means of plastic shrink packaging. For smooth assembly you will receive the required bits and drills with each Blue Rabbit® tower and swing construction. Ground anchors are also delivered with all Blue Rabbit® tower and swing modules for anchoring the equipment. You know that with Blue Rabbit® products you don’t buy an empty box but top-quality products that are delivered ready for use. You can recognise all components by their Blue Rabbit® logo and the rope connections with personalised plastic joints. All beams are connected with solid bolts and all nuts are protected with plastic bolt caps. All Blue Rabbit®towers have a set of ground anchors and all the required hardware, including drills and bits. The space under each Blue Rabbit® tower can be set up as a sandpit. And, whoever builds a Blue Rabbit®@SWING also owns a sturdy swing. 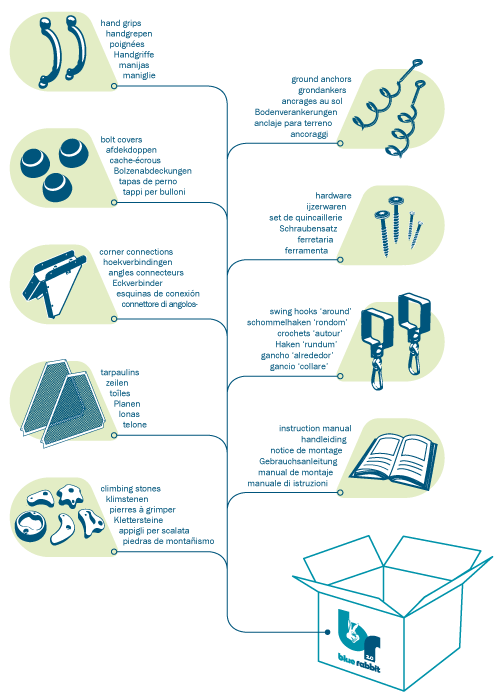 The Blue Rabbit 2.0 modular system offers you a multitude of options and combinations. Fitting any budget and garden space, and suitable for children of all ages. Towers expanded with climbing or swing modules will be fun for toddlers and challenging for youngsters. Budget-friendly freestanding swings fulfil the range. 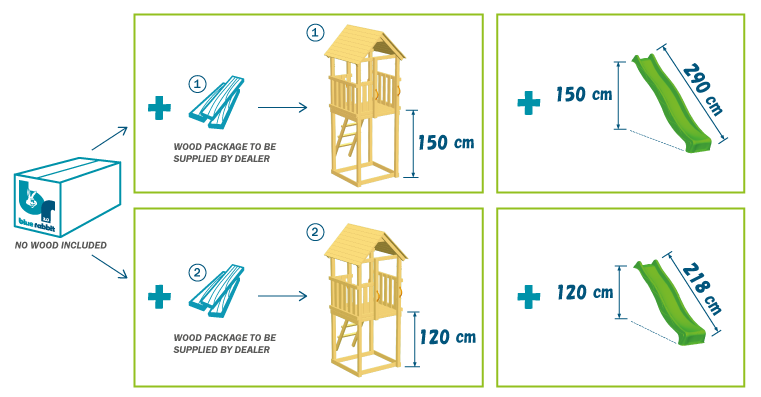 Most play tower models give you a choice of platform heiht: 1.2 m or 1.5 m in most towers and 60-90/90-120cm on the Cascade. The building box is the same for both platform heights. Per tower design there is one building box to be combined with a wood package as specified for the desired platform height. Our clear wood cutting lists specify the wood packages for both platform heights of each play structure. All practical info can be found in the seperate product data sheets or in the bundled wood cutting list. CLARITY is the guide in the concept of Blue Rabbit® towers, modules and their manuals. Each Blue Rabbit® box contains full documentation on the programme and very detailed step-by-step manuals for the correct assembly of your playground equipment. The Blue Rabbit range is delivered by courier. You will receive several parcels of timber, slide and kits boxes, you will need to check that they all arrive when you sign for the goods against the delivery note (each parcel has a number and also the total number of parcels for that consignment). Any problems, please write on the courier delivery note, and let us know the same day so we can track the missing parcels. The delivery is kerbside only, so the driver cannot enter your house or garage so you might need to have some extra hands to move the parcels to where you want to store them. If you cannot help, please contact us before the delivery date. Please also do a quick visual inspection of the slide to detect any damage, and write in the delivery note if there is any damage to the slide or the packaging of any of the other parcels. This is an example of a single tower (Beach Hut) packed ready to be dispatched.